House dust mites (HDM) used to be mange-like parasites and several of its modern allergens reflect the mite's former way of life. The most destructive of these allergens has the ability to cause the death of delicate cells protecting lungs and nasal passages. New research findings throw a different light on the house dust mite. It is not a harmless scavenger living in our homes, but a parasite that morphed to become a scavenger. The saying 'poor-little-mite' is no longer appropriate. House dust mite colonies should not be welcomed to live indoors they cause disease, promote the growth of fungi in their droppings and carry bacteria as they scavenge about in the dark. Developing children are most at risk from house dust mite exposure. Allergic asthma, rhinitis and eczema are all common childhood diseases. Beware, and Be Aware! 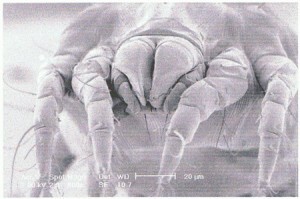 The House Dust Mite, London School of Hygiene and Tropical Medicine. The house dust mite has no eyes, no respiratory system, is 75% water and has one of the smallest brains in the animal kingdom.